Frieda Loves Bread: Caramel Apple Crumb Bars! 2 Caramel Apple Crumb Bars! A great combo of apple pie, apple crisp, and caramel apple all rolled up in a bar that you can pick up and eat with your hands! The recipe is easy, simple and will get compliments every time you make it. I made this recipe in a contest with the help of Orson Gygi and Peter's Caramel. 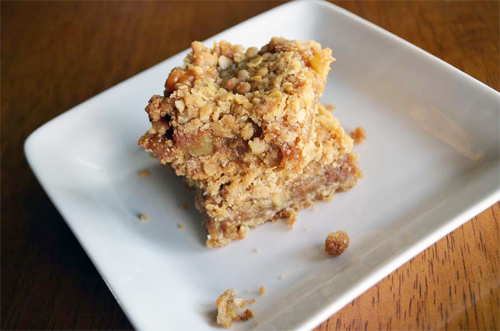 Hop on over to get the RECIPE and VOTE for the Caramel Apple Crumb Bars! Voting is open till Sunday, October 14th. This recipe looks fantastic. I cannot wait to make it and eat the whole pan. These bars look so great. They're perfect for a fall party!